The first season with NHL hockey back in Winnipeg was a big, successful party. Fans flocked to see the new Jets, turning MTS Centre into the closest thing the NHL has to a college atmosphere, complete with creative chants and wonderful spurts of near-deafening noise. There were November nights in Manitoba that sounded like other NHL arenas in the postseason. The Jets were a significantly better team at home than on the road, and the crowd played a role in that (though tough travel, both for the Jets on the road and teams coming to MTS, also was assuredly a factor). General manager Kevin Cheveldayoff made one big addition and a secondary one to help his club's forward group. He also added a new backup goaltender, and locked up the franchise guy in net. Whether or not the improvements are enough to make the Jets a playoff contender remains to be seen -- they are still in the Southeast Division, which significantly improved, thanks to major moves by the Carolina Hurricanes and Tampa Bay Lightning. 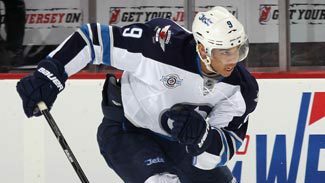 Under-valued: Evander Kane – You might be wondering why a 30-goal scorer is on the under-valued list, but Kane has all the tools to be an elite fantasy player -- he could finish this season with 30-plus goals, 65-plus points, more than 300 SOG and more than 65 PIMs. Over-valued: Olli Jokinen – His 61 points last season were the most since he tallied 71 with Panthers in 2007-08. Will center on the Jets’ top two lines, but don’t expect a repeat performance of last season -- think closer to 50 points. Sleeper: Zach Bogosian – Set career-highs in points (30), PIMs (71) and PPP (7) despite missing 17 games last season. A lock for 150-plus SOG every year, Bogosian could eclipse 40-point mark this season. NOTES: Jokinen, signed as a free agent, likely gets a chance to replace Little on the top line to start the season. Ladd, Wheeler and Kane are locks to be top-six wings, but that fourth spot, not to mention the two slots on the third line flanking the team's top faceoff guy (Slater) could go in a number of different directions. Burmistrov is still young and oozes potential, so he deserves a chance to play with skilled linemates. Top prospect Mark Scheifele could force his way onto to the team, either in Little's place in the middle or landing next to him on the second line. Antropov, Ponikarovsky and Wellwood are possibilities to play on the other side of Kane. Ponikarovsky has 19 goals in the past two seasons and four in 65 career postseason contests, so don't be surprised if he's the odd-man out from the top nine. Antropov would be on high alert if Scheifele has a strong camp. Though Burmistrov deserves a long look in the top six during camp, he, too, could get shuffled to the back of the pack. The first four of the defense corps looks set, though there could be a bit more to come from Bogosian. Postma is on a one-way contract, so expect him to stick over Derek Meech, who has a two-way deal. Pavelec has a big contract and an offseason arrest to add to the pressure already on a goalie who sees a ton of rubber every night. He has games when he looks like a future Vezina candidate, but the overall numbers are still not at an elite level. Those statistics need to get there for him to be worth his new deal and for Winnipeg to be a playoff contender. Montoya had some moments with the New York Islanders and could be a quality backup.